“This regatta will present an extraordinary number of valuable opportunities for our community,” said William Graham-Welton, Chief Financial and Operating Officer for BIOS, of the announcement by race officials in New York. “The America's Cup is known for pioneering advances in marine technology as well as supporting local environmental and educational initiatives,” he said. Bermuda has a rich sailing history. In the 17th century, Bermuda revolutionized the sport with the Bermuda Rig, a rigging configuration used on modern boats. In the following centuries, Bermuda produced some of the most successful yacht designers and sailors in history and has drawn some of the world's greatest sailors to the legendary Bermuda ocean races and Gold Cup match. To select the host location, America’s Cup officials worked closely with potential venues to finalize logistics requirements and commercial opportunities, as well as to establish the needed relationships with private and public entities to ensure a successful event. 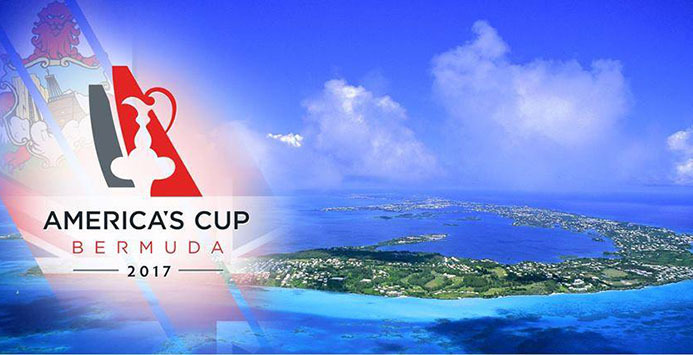 “In Bermuda we have a perfect international venue to demonstrate the excitement America’s Cup boats and teams can generate,” General Harvey Schiller, Commercial Commissioner of the America’s Cup Event Authority said. “The sailing conditions are near perfect. The race course on the Great Sound is a natural amphitheater with room for racing and spectators, amid a spectacular backdrop of islands and beaches. And the proposed America’s Cup Village at the Royal Naval Dockyard will be the heart of the event for the teams and fans alike. On Wednesday evening, in celebration of Bermuda’s win, the public are invited to attend a special block party on Front Street. At the Front Street event, the Cup will be presented to the Premier, the Hon. Michael Dunkley, and to the people of Bermuda. The schedule of events will feature the Bermuda Regiment Band, the Gombeys, fire dancer performances, live music by the local band Working Title, a 3-cannon salute and a fireworks display. Activities kick off at 5.30p.m. on Wednesday 3 December.